easy no bake holiday dessert! This quick festive dessert made with gluten free ingredients. Non alcoholic version too! First, mash or grind gluten free graham crackers into crumbs. It doesn’t need to be very fine, just crushed by hand or in a food processor. Place crumbs in a large bowl. Add the almond meal, coconut, and cocoa powder. Mix together. Next add your rum, maple syrup (start off with 3 tbsp and add an additional if batter is too dry), extracts, and peppermint. Mix together again. Place bowl/batter in fridge.Chill batter 30 minutes or long. Once batter has chilled, roll into truffle size balls. A little smaller than golf ball size. You should get anywhere between 17-20 ball. Place on a cookie sheet. Melt your white chocolate in on the stove or in a microwave safe bowl. If you are using microwave, simple melt the chocolate in 30 second intervals, stirring between. Once the white chocolate is melted, dip the coconut rum balls in the white chocolate and place back on cookie sheet. Repeat until all the balls are coating. 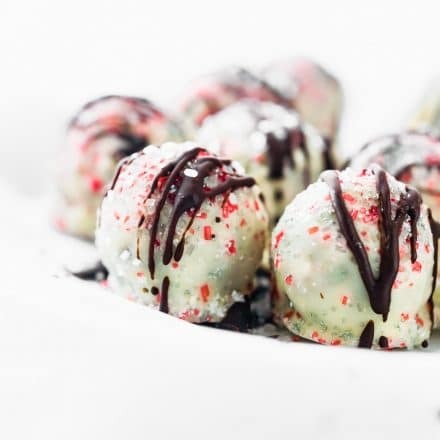 Sprinkle crushed peppermint or red sprinkles on top before they set. Place in freezer for about 10 minutes. While the rum balls are setting, melted your dark chocolate. Similar to the white chocolate, simply melt on stove or microwave, stirring until melted. Remove the rum balls from the freezer and drizzle the dark chocolate on top. I did this with a small whisk or fork. Sprinkle sparkling cane sugar or more sprinkles on top if desired. Place back in freezer or fridge until chocolate has harden. Store in fridge until ready to serve. If you want to make a non alcoholic version, take out the 1/4 cup rum and use 2 tbsp of almond or coconut milk. Then add in 1 tsp rum extract.